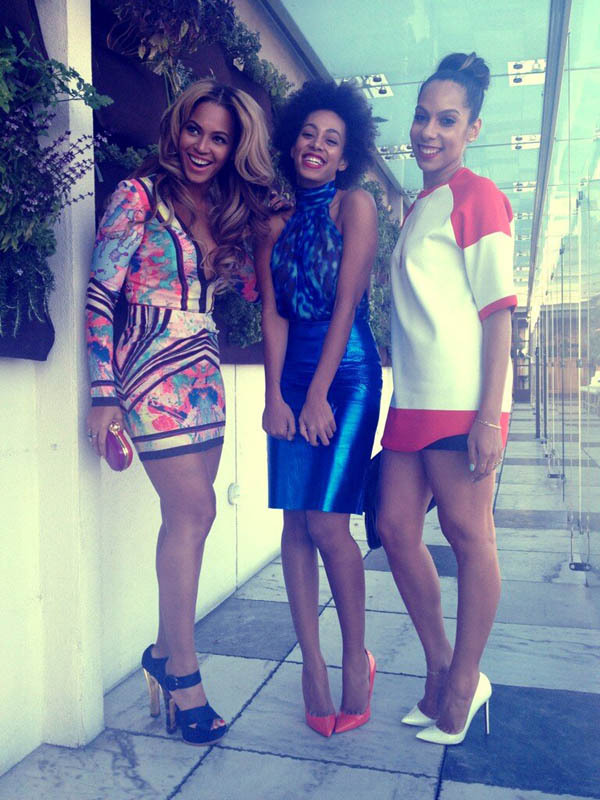 Beyoncé, Solange, and music director, Melina Matsoukas attend Roc Nation’s 2013 Pre-Grammy Brunch. Beyoncé wears a Printed dress from Elie Saab’s Spring 2013 Collection and Louis Vuitton Cruise 2013 Platform Sandals. I love her look! Beyoncé and Rihanna smile for the camera at Roc Nation’s 2013 Pre-Grammy Brunch. Rihanna wears a multi-colored Céline Blouse and matching Pants. Some people said that she wore her pajamas to brunch…. What do you guys think? Are you guys feeling Beyoncé, Solange, and Rihanna’s looks? Are you guys excited for the Grammys tonight? Share your thoughts!